Locals report that they have spotted two tigers on the loose in Dong Nai province (near Ho Chi Minh City) but while military officials maintain they are actually tigers, forest officials say they could be dogs. 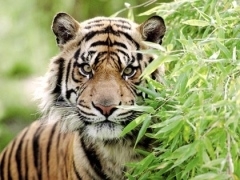 Le Viet Dung, deputy head of the provincial Forest Protection Department said that environment police are investigating a report by locals that two tigers have broken loose from their cages and wandered into an indigo forest in Quang Tien commune, Trang Bom district. The district military cell has reported the tiger sightings on July 15 to the local People’s Committee. Military forces arrived on the scene and reported they saw tiger footprints. They told locals to shut their doors tight. But according to Dung, his forest agency has inspected the footprints and they look like they could belong to a big dog. On Monday, the Giang Dien waterfall tourism site rejected rumors that the tigers come from its cages, confirming it does not buy or raise any wild animals.